It’s been two years since Benny Friedman released Kol Haneshama Sheli, the hit album which featured “Toda”, “Bum Bum”, and several other hits. His new album, Fill the World with Light, might be his best effort to date. Yes, you heard that right. Benny’s new album may actually be better than Yesh Tikvah. I would have considered that you be a near-blasphemous statement a month ago, but after listening to Light non-stop for the last month, I can confidently make that assessment. A couple of weeks ago, Benny was in Israel to perform at the annual Yud Tes Kislev festivities in Kfar Chabad, and he was able to find a few extra minutes in his schedule to chat with me about getting into the business, the new album, and the lessons he feels his music can teach us. Many of the questions I was going to ask were already answered by Sruly Meyer in the behind-the-scenes article he wrote for JMR right after the album release, but there were still a few questions I had for Benny, not the least of which involved a certain mini concert in the Catskills around 15 years ago…. The transcript below has been lightly edited for brevity and clarity. Shimon Simpson: First things first…I don’t know if you already made the connection, but I in my review of Kol Haneshama Sheli, I wrote about being the saxophone player at your first ever concert at Camp Romimu [when you were impersonating Avraham Fried at the camp’s color war breakout]. So, I would be remiss if I didn’t ask you what your recollections were of that night. Benny Friedman: Oh wow…I remember that night, very clearly. They told me that they were bringing in a professional makeup artist, he put a beard on me, and I looked in the mirror and thought to myself, “There’s no way anyone is going to fall for this.” And then through the whole show, I was thinking that only the head counselors and the directors think anyone is falling for this. BF: I know, because on the video you can see Kus [Yekusuel Sebrow, the keyboard player] pointing at you and laughing, and you were standing there with a confused look on your face and shaking your head. SS: Yeah, I think I was literally the last person in the room to figure out what was going on….But hey, it was camp, it was color war, it was all in good fun. 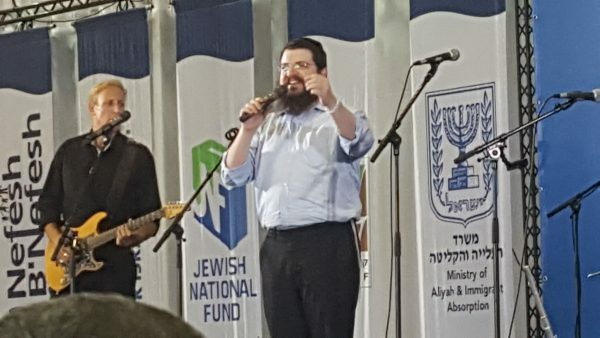 And I’ve been milking the moment ever since because I can tell everyone that I played at Benny Friedman’s first concert. …Fast-forwarding to the present, I think “Ivri Anochi” has a chance to surpass “Yesh Tikvah” as the top hit in your catalog. [As a co-producer on the album] you had input into the decision making process. What was it about “Ivri Anochi” that inspired you to put the song first on the album? BF: …The truth is, there’s very little “figuring stuff out”, and a lot of it is very visceral—very instinctive. I was listening to an early version of “Ivri Anochi” in the studio, and it just spoke to me. So I called Sruly [Meyer] and said “Hey we have to shuffle around the order of the songs, ‘Ivri’ has to be first.” I love the song, because, first of all, it’s a “Jewish pride” anthem. It’s got a major message, and I try to choose songs that have a message—that encourage you about something. And this song can become something that people turn to if they need some encouragement. SS: Moving on to the second song, “Al Tishlach Yadcha”, I was wondering if you had made this connection to the Avraham Fried song “Yochid v’Rabim”. In that song, the theme is that because Hashem is the “Yochid” and we are the “Rabim”, Hashem (kaviyachol) “has to” listen to us and return to us before we can do teshuva. It’s almost the same thing in your song, when you take Hashem’s words at Akeidas Yitzchok, “Al Tishlach Yadcha el hanaar”, and use them against Him, as it were, saying that He kind of “has to” bring the geulah based off his own words. Did you make that connection on purpose? BF: I never made that connection! That is very, very cool. But yeah—some people start getting uncomfortable when you start talking to the Eibishter like that, making demands, and trying to “outsmart” Him. But there is precedent for it, where old chassidishe rebbes like R’ Levi Yitzchok of Bartitchev would find a “chap” to say to the Eibishter “Now, You have no choice!”…. You see in this week’s parsha [Vayishlach], that Yaakov was given the name “Yisrael” [which means “someone who struggles with the G-dly”]. When a Yid sees something in the world that he doesn’t understand, doesn’t agree with, doesn’t seem “right”, you have to—as much as you can—push back against it and protest, and say, “Eibishter, according to the seichel, and according to the middos that You gave me, whatever it is that I’m seeing right now is not right. So, either bring Mashiach so we can see how right Your decisions were, or help us understand now, make life easier! Stop creating difficult situations so we have enough to be in a situation where we don’t understand what You’re doing.” The thing about this song is that I generally try to keep away from songs that are sad or heartbreaking just for the sake of being sad or heartbreaking. This song is heartbreaking, for sure, but it’s heartbreaking with a big message. SS: [Regarding Sruly Meyer’s contributions to the album,] I remember something Sruly said a long time ago on his podcast when Dov Katz asked him about his suddenly showing up as a credited producer on albums, Sruly said something like, “Yeah, that means I picked up the sushi and brought it to the studio”. I always kind of figured that that wasn’t 100% true, but with this album it was obviously not the case—it seems that he was a really big part of the creative process. BF: He was. First of all, when he was hearing the original material, it was automatic—you could see how the ideas started pouring forth. Second of all, the more experienced he’s gotten, the more confidence he’s shown in his production skills—same as me. SS: Who was the clarinet player on “Laasoik”? I don’t think he got mentioned in the liner notes, and I think it’s the best Jewish swing song since either “Adam Doeg” or “Hisyatzvu”, so I was curious who provided the song’s signature solo. BF: Cliff Lyons. He’s incredible, he’s been on tons of Jewish records…He’s a genius, and if you watch the YouTube videos that all of the bands are putting out nowadays, you’ll see him all over the place. SS: Last question: Is that you doing the chazzanus in “Kol Yemei Chayai”? I wasn’t sure as I was listening to it, and for a minute I thought it was [Chazzan Y.M.] Helfgot, but I couldn’t tell. BF: [Laughing] No kidding! No, that was me. SS: I figured you wouldn’t have had Helfgot on the album and 1) not mention him in the liner notes, and 2) only have him on there for two bars. SS: Right, it could have been Lemmer…I liked the chazzanus in “Es Tzemach Dovid” also, but that was a different style. BF: Right, a totally different voice. SS: OK, great, thanks! I really appreciate you taking the time to talk with me, and I hope you enjoy the rest of your trip to Eretz Yisrael! It’s actually amazing…in a year in which Jewish music heavyweights Yaakov Shwekey and Avraham Fried made us “believe in miracles” as they “brought the House down”, it’s Benny Friedman that comes through with the late entry for Album Of The Year—and this is only his fourth album! I’m not even going to have to do a roundup for this year, because the contest is already over—Benny wins, hands down, and it wasn’t that close. Once again, special thanks to Benny for agreeing to take the time for a conversation during his trip. A freilichen Chanukah, everyone!